As his name suggests, Richie is a barber, but deep inside he has always been a clown. He can trace his fascination – some would go as far as calling it obsession – with clowns to his early childhood days, when he met his first clown. Instead of being afraid of him, Richie was amazed by all the tricks and juggles the clown performed, and remembers the advice he got from the clown to this day: whenever you’re feeling down, just juggle. That’s when he knew he wanted to be a clown too. At first, people thought Richie was kidding when he said he wanted to be a clown when he grew up, but as he kept sharing his dream, he could see that no one really understood him. So he became what he calls a “closet clown” for years, until he moved to Hollywood, where he could finally become what he wanted to become. Breaking through his shell and releasing his inner clown was tough at first, as Richie remembers people didn’t really get it. They would look at him strange when he would juggle, and tell him things like “dude, what are you doing? Barbers don’t juggle”, but he didn’t let those things put him down. He kept clowning, the way he had always dreamed. He got a unicycle and spent a lot of time learning how to ride it without crashing, then he started juggling, all the while having all kinds of things tattooed on his face. His obsession with clowns and the face tattoos did affect his personal life, as his girlfriends would always dump him because of them, but he didn’t let that stop him from fulfilling his dream. As time went by he pushed his obsession with clowns further. He tattooed his face blue, got silicone implants to achieve impossibly-arched clown eyebrows, got half of his nose tattooed red, as well as his mouth, and started shaving the top of his head. He became a real-life clown. 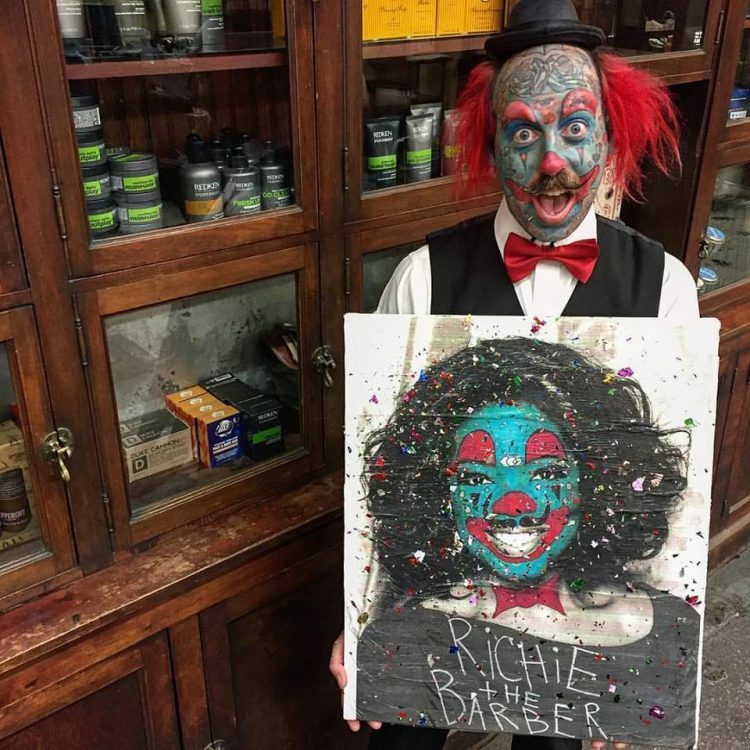 Richie the Barber also collects clown memorabilia, his closet is full of colorful clown clothes and accessories, and he even incorporates his clown obsession into his work. When he’s cutting people’s hair or shaving them, he’ll sometimes throw confetti into the air, start juggling, or just slap a party hat on their head. He’s clowning all the time, just like he always dreamed. Would You Spend the Night at This Creepy Clown Motel?